Is the Balayage Hair Trend Right for You? Heard About the Balayage Hair Trend? Read On to See if It’s Right for You! Many of our clients come in looking for a great way to change up their look without having to commit to a specific type of hair color. The balayage hair trend is one of the hottest new diverse highlighting techniques and it’s a look we happen to specialize in creating! This method opens doors to specialty colors without the harsh commitments of a typical one process color or traditional highlight. Balayage means “to sweep” in French. The technique gets its name from the sweeping motion colorists use to paint balayage highlighting into the hair. 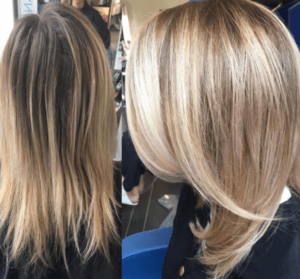 Rather than using the standard foil method for highlighting, balayage requires an artistic approach, resulting natural variations of color. The regrowth is softer and easier to maintain than your standard foil highlights. 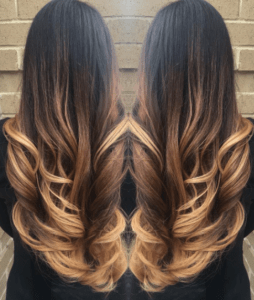 There are two main styles of balayage hair coloring: Ombre and Sombre. Ombre starts with dark roots and ends several shades lighter at the tips. Colorists need between three and four hours to complete ombre highlights. While ombre can be easy to grow out, depending on how closely your roots match the darkest shade, it is definitely a change in look. Sombre blends higher up to achieve a more natural look with completely light ends and only subtle hints of dimensional darkness going through. Balayage results in gorgeous, natural and luscious looking hair. Clients opt for balayage to achieve both dimension and reflection without the commitment of traditional hair color. Call Urban Halo today to set up a consultation with one of our very talented artists to see if balayage might be your look for the summer. © 2019 Urban Halo Salon. All Rights Reserved. CANCELLATION POLICY: Appointments require a credit card guarantee. Please arrive 15 minutes before your scheduled appointment. Kindly provide at least 24 hours notice for all appointment changes and cancellations. Missed appointments and same day cancellations may be subject to a fee of 50% of your scheduled service. Arrivals 15 minutes after scheduled appointment time will be considered late and may result in loss of reserved appointment time at the discretion of Urban Halo Salon. Arrivals 30 minutes after scheduled appointment time will be considered a missed appointment. We accept cash, Visa, MasterCard, American Express and Urban Halo Salon gift certificates.Gratuity may not be added to credit card payment. For your convenience, an ATM is located inside the salon. We do not accept personal checks.